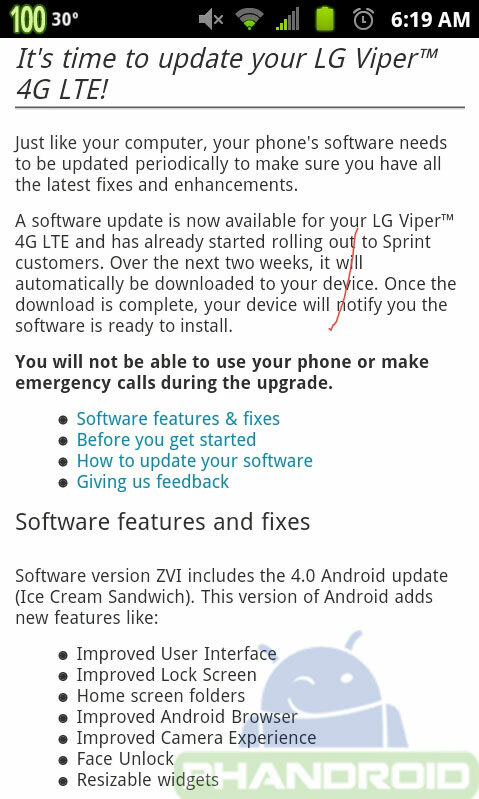 LG Viper 4G LTE to receive Android 4.0 ICS update in the coming weeks. 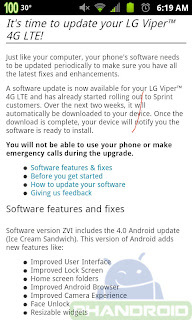 HomeAndroidLG Viper 4G LTE to receive Android 4.0 ICS update in the coming weeks. Its hard to believe that Android 4.0 Ice Cream Sandwich updated have still not been completed. Especially now that Android 4.2 Jelly Bean has been released. Users of the LG Viper 4G LTE will be happy to know that they wont be kept waiting too much longer as the ICS update is reported to be heading to the device sometime in the next two weeks. Users will receive another notification when the update is ready for their device, at which point they can download the update Over-the-Air (OTA) which will carry the software version ZVI. Facebook will bring several new features and improvements to the Viper including Face Unlock, resizable widgets, camera improvements, an improved stock browser, home-screen folders, and an improved lockscreen. The LG Viper features a 4.0 inch touch display, 5 megapixel camera, a secondary camera for video calls, 4GB internal storage which can be expanded through microSD and is powered by a 1.2GHz processor with 1GB of RAM. We have seen similar hardware strain after being updated to ICS and we hope that this wont be the last update for the device. We are sure it will greatly benefit from the feature and performance improvements from Jelly Bean.